It was a gray, overcast day when we spoke with Leslie Bostion, standing on what is now a parking lot, but used to be the site for her home. Leslie and her husband Lewie lost their house in South Street Sunbury. It was a beautiful double house sitting on a large lot, but was damaged by fire in July 2006. The structure was relatively unscathed, but there was a lot of internal damage. 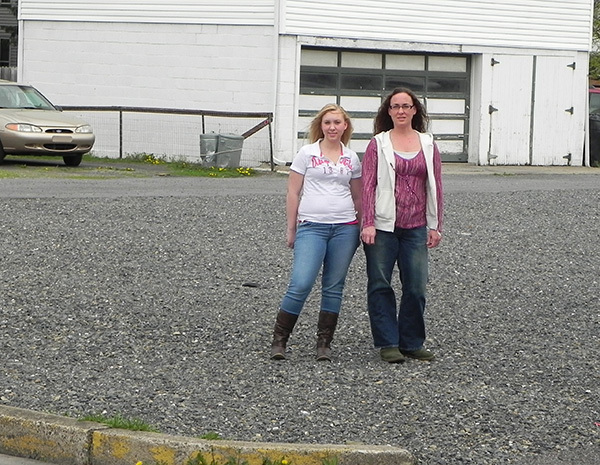 Leslie and daughter Natasha Bostion – this empty lot used to be the site for their home! At the time Lewie was out of work and could not afford to rebuild. The house remained boarded up, but he did some restoration work to it from time to time as finances became available. 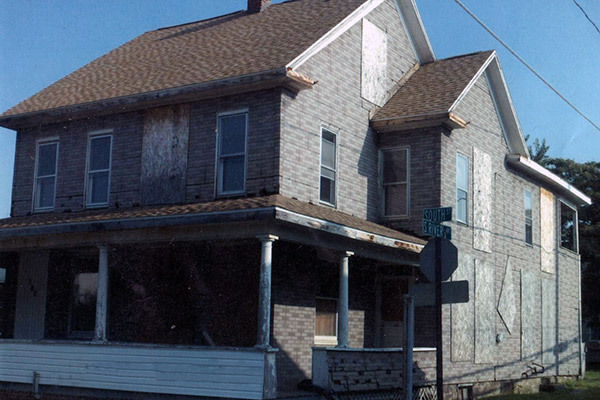 In 2010, just after the reformation of the Sunbury Redevelopment Authority, they included this house in their list of blighted properties, and then, early in 2012 the City moved to demolish the house. The hearing was before Judge Wiest. Leslie went along to represent herself and explained to the judge the position they were now in and how they were able to start refurbishing the property. He asked City Solicitor Apfelbaum to grant them time to get their house in order. Apfelbaum refused. He appeared to want this property, on behalf of the Authority, in the worst possible way. The court granted his request. The Bostion House in South Street – after the Fire. The house was demolished shortly afterwards. It is now, conveniently, being used as a parking lot for tenants of neighboring properties owned by Councilman Jim Eister, and there do not currently appear to be any plans for redevelopment. Once again we see Persing, acting through the Redevelopment Authority, taking over perfectly viable homes which could be refurbished, and instead of this, having them demolished. The Bostions received nothing for their house – not a cent – some might call this theft – it could certainly never be referred to as redevelopment. Sunbury is full of empty lots which, in many cases are being used for car parking. This is diminishing the tax base and putting up taxes for everyone else, and under no stretch of the imagination can it be construed as beautifying our city. There is also something inherently wrong in a city getting itself into the real estate business, as the temptation is always there to view such operations as money making, rather than care about what should be the prime consideration – what is best for the citizenry and, in particular, what is the best solution for each individual “blighted” house . Some need to be taken down – others which are repairable should be repaired, and the City should be providing some kind of finance to help with this – better to do this than to continue to reduce our housing stock, our tax base, and to lose huge sums of money in a business of which they have no knowledge and in which they should not be involved. This is heartbreaking! How in America is this permitted to happen? This is not redevelopment, it’s criminal!